This divinely balanced Double Figurado is packed with flavors of honey, moist earth and precious woods. The smallest of the Cuaba's has a large fan base and appeals to those who enjoy a tangy, edgy type smoke. 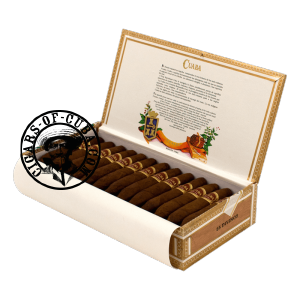 The Cuban cigar is immediate and can surprise by its rapid build in power, especially the finish. Even though this is a small cigar, it does have excellent aging potential. It begins with an earthy taste, more or less spicy. A dominant earthy, woody taste. The final is mellow with roasted nut hints and powerful.